I had a closer look at your code and it’s really nice. Thanks again. Getting the button ID is certainly the “proper” approach. For the record, here is a shorter mouse_event implementation. if msg == 0x0204:       # WM_RBUTTONDOWN. windll.user32.mouse_event(0x0002, 0, 0, 0, 0)   # Left down. WM_RBUTTONUP is sent although the right button is still down. elif msg == 0x0205: # WM_RBUTTONUP. if RIGHT_CLICK_MODE:        # Another WM_RBUTTONUP is sent when the right button is released. Send "Left up" now. windll.user32.mouse_event(0x0004, 0, 0, 0, 0)   # Left up. else:   # The right button is still down. elif RIGHT_CLICK_MODE and msg == 0x0201:        # WM_LBUTTONDOWN. This is PythonScript console when using NPP in a RTL layout. Reading the LTR output in a RTL layout is obviously inconvenient. @dail has kindly added an option to force LuaScript console to LTR. Do you think it would be possible to force PythonScript console to LTR using some code in startup.py? Or would it require some modifications in PythonScript source files? If and when you have some time to think about it, I’d be grateful. if dails commit solves your issue with lua then I don’t see why we could get this to work with python script. The hard work to find out what needs to be done has been already done by @dail, thank you ;-). and change the style parameter for that window. Doesn’t sound undoable. to make it happen but compiling and testing needs to be done on your site. Am I right to assume that you do not only need RTL layout but also RTL reading, correct? 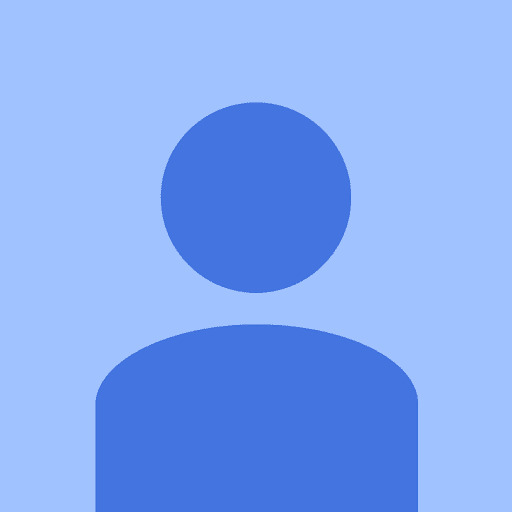 Or do you really want to have LTR layout in python script while using RTL layout in npp? Thank you for your patience and kindness. Highly appreciated. And allow me to thank @dail again for LuaScript in general and for the console issue in particular. And, as usual, you already have the solution. The InputBox in PythonScript is LTR even when NPP layout is RTL (so it doesn’t have to be modified). You can change NPP text direction whether the layout is LTR or RTL (View -> Text Direction LTR/RTL). The console’s frame and input are always LTR. The problem is the output. 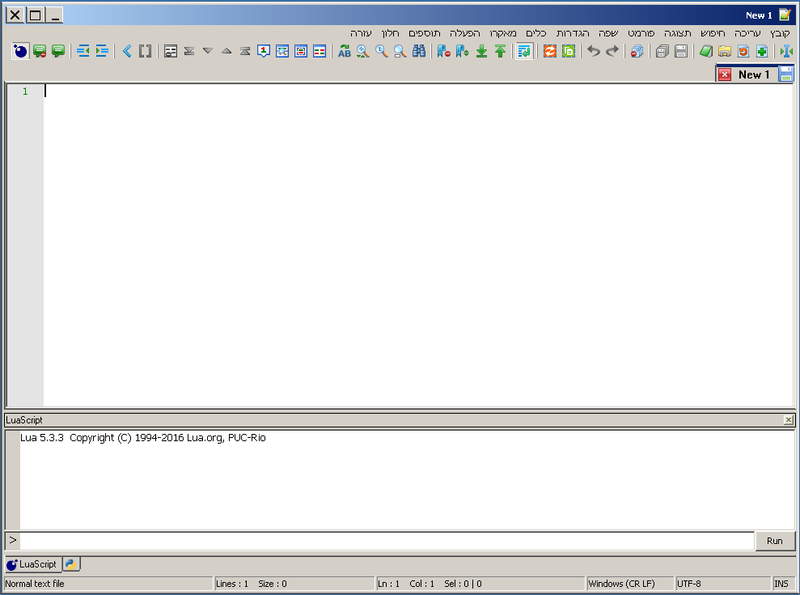 This is NPP in RTL layout with LuaSceipt console in LTR (perfect). 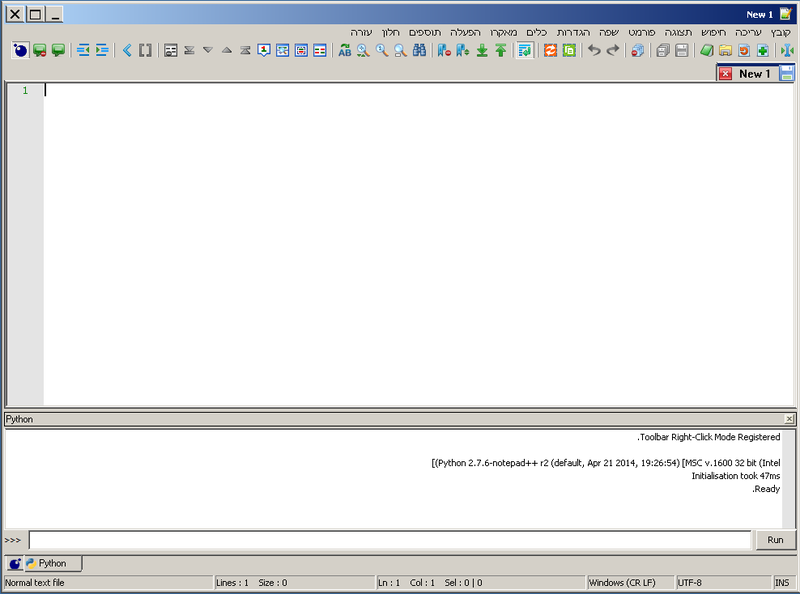 And this is NPP in RTL layout with PythonSceipt console in LTR (frame and input) and RTL (output - confusing). I’d like to see the output as you see it in LTR layout. This may further complicate the issue but OTOH it might help. The status bar in both screenshots is LTR. // Change to LTR. "WS_CHILD & (~WS_EX_LAYOUTRTL)" above won't work because WS_EX_LAYOUTRTL is added AFTER the bar has been created and inherited the RTL layout. Can SetWindowLongPtr() be used via 'ctypes`? Thanks again and good night. ok and yes SetWindowLongPtr() can be used. I didn’t came across a windows api function which can’t be used with ctypes yet. SetWindowLongPtr has not been transferred to wine. Thank you very much. This is beautiful! I get the AttributeError: function 'GetWindowLongPtr' not found error. What should I import from ctypes? can you do an test output to the console (preferred last line of code) and run the script at least two times. Let me check about the Set/GetWindowLongPtrW. I had put the code in startup.py. I’ve now moved it to a separate script and run it twice. no I meant using the GetWindowLongA as I did. It does write to the console. Both exStyle = exStyle & (~WS_EX_LAYOUTRTL) and exStyle = exStyle ^ WS_EX_LAYOUTRTL do change the the layout. I have to clear the output first. Otherwise it’s gibberish. this seems to be my waterloo in terms of understanding bitwise operations. I always confuse when to use OR and when XOR. So, just to clarify, this works? written to the output. So the initial state will be RTL until something gets written. If I put the code in startup.py it doesn’t work even after writing to the console.